My first hydro grow/experiment was very interesting. I learned a LOT, but I had mixed results/success. On the plus side, all the plants actually survived until harvest and looked very healthy all through the grow. I also got a respectable amount of bud. My gms/watt/sq ft were good. On the down side, I had lots of hermies, and by the end, root rot forced me to harvest early. That made for a weak end product. The RSO I made from the bud was not very potent, but it still gives me a nice mellow hi. Some of the key things I learned had to do with water/air ratios. Less water and more O2 seems to be a key factor. BUT - you cant let the roots dry out or you end up with root rot. You can also get root rot if the roots get too much water and not enough O2, so a balance needs to me maintained. 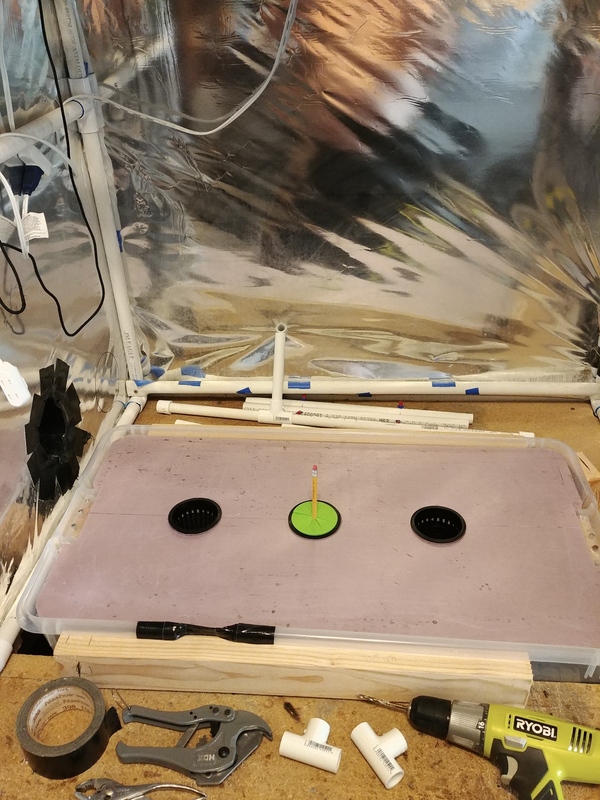 After a lot of back and forth, Ive decided to try a DIY version of Low Pressure Aeroponics with an NFT twist added on. One of my main goals this time around is to learn to clone, but to also be able to start a clone/cutting or seed and have it stay in the same container and tent from start to harvest. Should be interesting to see your results this time. You seem to have a very methodical and scientific mind. Hope your experiments are fruitful. Life keeps happening around me so Im distracted and busy at the moment, but here are a couple of quick shots of current situation. I heat stressed the two extra clones a few days ago. Temps got up to 95 in the tent because I forgot a had the "fresh air" coming from outside - where the temps were in the 90's - while I had the lights turned up a bit to perk up the babies after being on a low lite diet for the last 3 months. They wilted like crazy, but came right back after reducing the heat and giving them some water. So yesterday I cut three new clones. I took the top cola from each and one side branch that was fairly long. These are much bigger than most folks take for cloning, but one of them accidentally got cut down to size when my exacto knife slipped, so the shortest new clone is actually from what was the largest cutting Oh well, I have a bunch left to play with if this doesnt work out. First - here is the short version of what Im doing now. 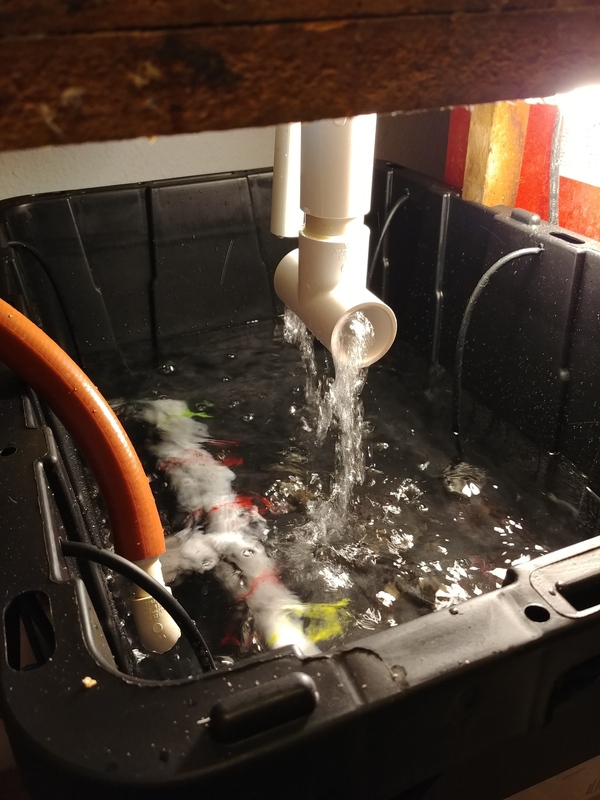 The system is a 17 gal rez, feeding up to a sterlite under bed storage container that is about 20" x 35" or so and about 7" deep. The rez has 6 fluming air "stones" that are not stones, plus the returning water from the aero container waterfalls back into the rez. Im using a 396 gal magnetic drive pump that feeds some 1/2" PVC DIY "sprayers" in the clone container. All it is is 1/2" tubing with a series of very small holes drilled in it = aprox 1/32" in diameter. The pump puts out more water than the sprayer needs, so I added a T side branch that feeds back into the rez and water falls into it in a manner that also stirs the water and provides additional aeration. The pump is on a timer set to 1 minute ON and 40 minutes OFF 24/7. The container the clones are in is tilted enough so that no water puddles in the container while the water is ON. Thats the NFT part. The roots will not sit in standing water at any time - other than small puddles caused by the roots damming up the flow as they grow. Im using 3" net pots and no medium. Ive started a time lapse and will post that later. So far the new babies are actually perking up some rather than wilting as I would have expected. A couple of quick shots from the time lapse. Its been about three days now and the new babies seem to be doing well. I check daily, but no roots - yet There is some slight fading in the leaves, but its not bad and they are not drooping, so I dont think I will change anything - LITFA! Here is some of the thinking that went into this build. One of the main reasons for my first hydro experiment was to test the Membrane Meniscus system. 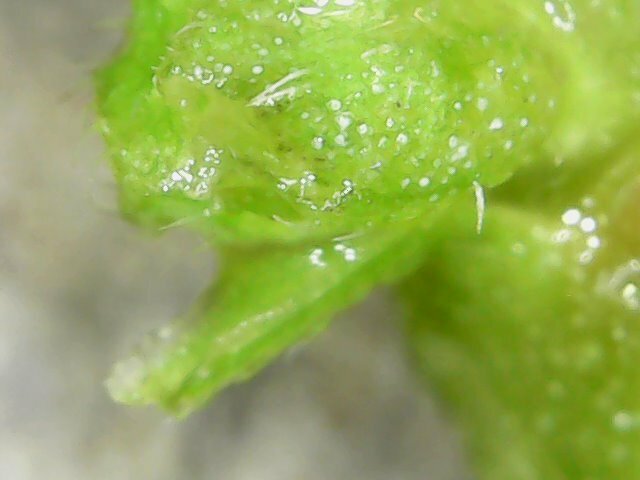 If you are curious about the details of that system, its all in the first few posts of the grow thread I linked above. Basically, its whole 'thing' is to provide the absolute thinnest possible layer of water/nutes to the roots at all times. The theory being that a super thin layer of water will self aerate and stay at 100% DO all on its own. That this layer is able to get O2 from the air and transfer it to the roots most efficiently. There are some other benefits to that technique, but thats the main one. 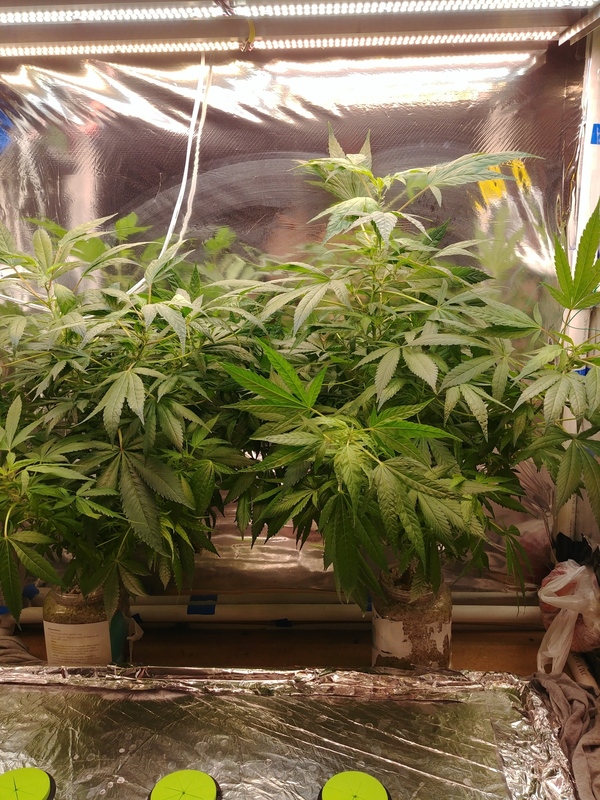 In my experiment, the Membrane plant did start out doing better than the NFT or E/F plants and had more and larger buds when it went into flower. In the end the plants were all more or less the same, but I think the membrane plant would have done best if the roots had not gotten through my 'membrane' and down into the nute solution. In any case, I am convinced that less water and more O2 is important. The question is how to get there equipment wise? I cant afford a hi-pressure aero or fog setup and the Membrane technique is just too fussy to set up. Plus its kind of boring - no gizmos! So that left NFT or low pressure aero. The vast majority of NFT setups Ive seen are not really NFT. 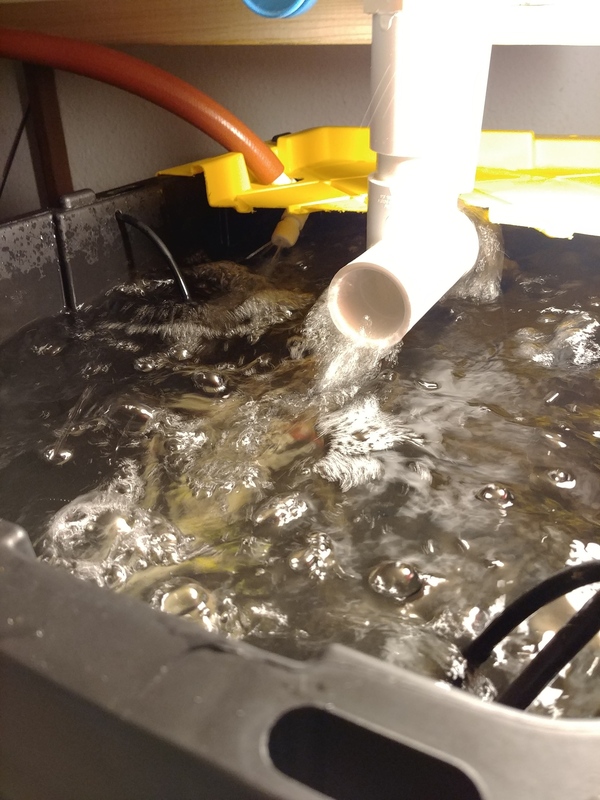 They use hi volumes of water flow which results in more of a Nutrient FLOOD Technique rather than a Nutrient FILM Technique. Flooding is not the same as a film. 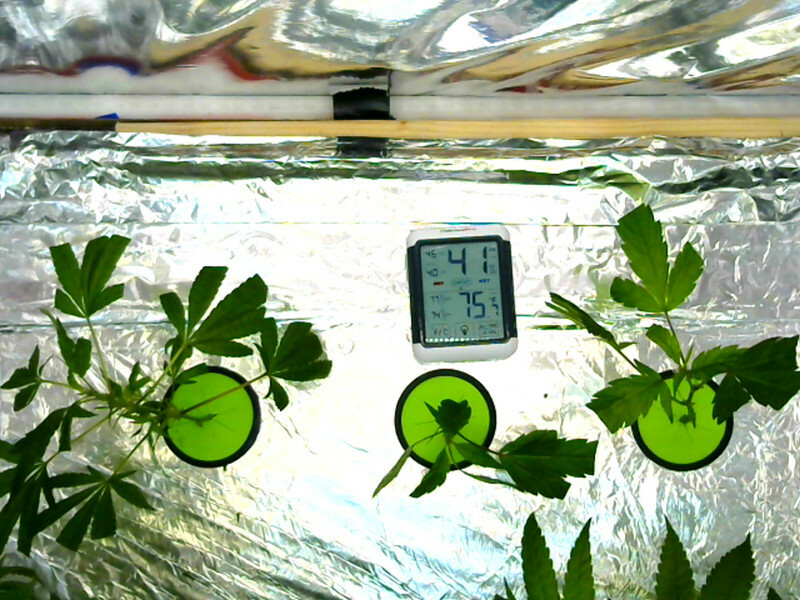 A true NFT setup just has the thinnest layer of water on the roots at all times - which almost no one actually does. Note that thin film thing - as in the Membrane technique and as in hi-pressure aero. 1) I need to be able to start clones or seeds and grow them to harvest in the same system with only minimal mods when switching from seeds to clones. 2) I want to provide the minimum amount aerated water with the max O2 to the roots at all times - no dry roots, but no flooded roots either. So I ended up going with a DIY sprayer system thats going to be ON for the minimum amount of time and off the max time possible without drying the roots. With my Sonoff timers, the shortest time ON is one minute, so thats what Im doing. Im at 45 minutes OFF now and my bump that up to one hour later to see how that works out. This is a long way from the ideal constant, uniform "thin layer" of water, but its the best I can come up with on a budget. 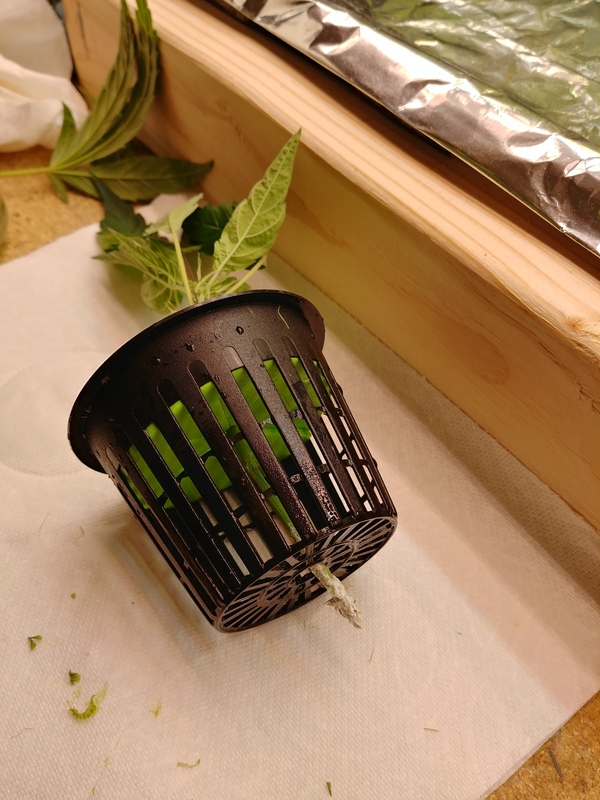 The roots will be flooded for one minute, but most of that water will drain off very quickly, leaving the roots with just a thin layer of water/nutes for the majority of the time. Im actually quite confident it will work just fine. From what I have read so far, I don think it really matters all that much which technique you use as long as you keep the main critical factors in line - proper temps, PH and nute concentrations. They can all be successful. Other than that, Im running the lights at around 100 watts at night, but I have to turn them down to around 30 during the hot part of the day. They are running 24/7. Im not going to be able to continue this grow to harvest unless the outside temps drop a LOT, so most likely I will root these babies and maybe swap out the older clones for future mothers. I suspect it will be mid to late Sept before I can do a full grow again. Ive bumped the EC up to .5 (250 PPM). 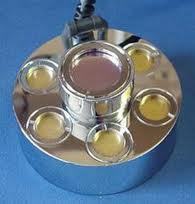 I have seen good reports from people running straight water for clones up to full nutes with an EC of 1.3 or 650 PPM. It makes sense to me that the plants need some nutes to help them grow new roots. Im keeping the PH in the 5.7 - 5.8 range. New idea percolating in my head.... an aerosol type sprayer to atomize the water. Think of an airbrush spraying water instead of paint. The question is - can I make that idea work with the very low air pressure from an aquarium pump? Are you trying to produce a fine mist, I assume? I know of some high pressure / low pressure fogger nozzles. But, might require "higher" pressure that being produced by an aquarium pump. I wonder if an ultrasonic fogger would work? Lot's of cheap foreign made units out there that might be worth a test. What pressures are you looking at from the aquarium pump? Yeah, I would like to get a much finer misting action than the spray I have now - but - I dont want to go the trouble of hi-pressure water with its super fine mist heads. Those 50 micron openings just plug up tooooo easily. Plus the pump and heads are $$. From my reading, most all of the cheaper ultrasonic foggers make droplets that are too small - 5 to 20 microns instead of the more ideal 50 microns The fog tends to be 'dry'. The cheap ones also clog up pretty fast and need a lot of maintenance. My aquarium pump only puts out about 2 PSI max. I just did a series of tests with the smallest pipets/tubing I have on hand and its just not enough pressure/velocity to work. I have a small 1 gal 90psi hobby compressor that I have used with airbrushes, but its loud enough to wake people living on the next block and rattles the windows when I use it indoors. Im sure it would work for what I want to do, but the noise is not going to be ok, so thats out. There are a number of "quiet" air compressors available these days (under 60 db), but the cheapest ones I have found are still up around $100 - which is more than I want to spend at the moment. I can easily DIY the atomizers, but I need a supply of quiet air at at least 20psi or more. I dont think I will need huge volumes, and the atomizers will only need to operate for maybe 1 minute every 45 minutes to an hour - possibly even less duty cycle. I could rig it up so the compressor only runs a few times a day - maybe. I have no idea how much air volume I would actually need to run 4 atomizers. Actually I dont know how many I would really need without more testing. 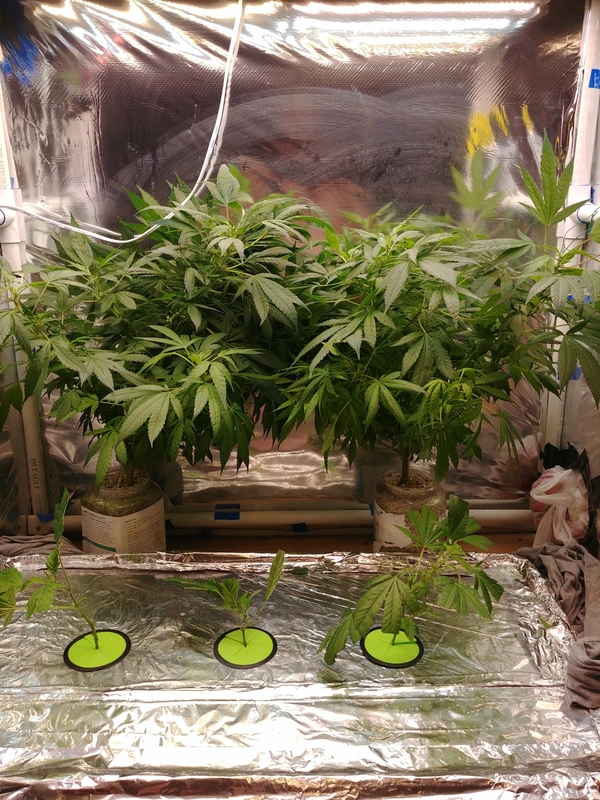 My last grow I had three plants and they drank about 3 gallons/day toward the middle/end of flowering, so I need a system that can atomize more than that amount of water per day. I think I can get by without running the compressor very often, but thats just a guess. So far, every time Ive checked for new roots, the stems on the clones are still sopping wet. Im going to start increasing the 'dry time' until they are almost dry between the water sprays. More random thoughts on trying an aerosol approach. These clones will not be taken all the way to harvest. 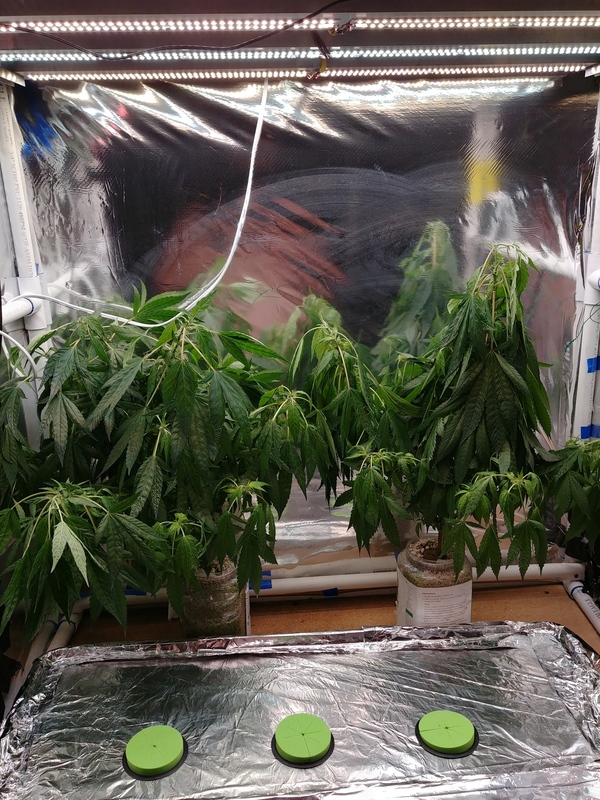 Im not going to be able to control tent temps if I turn the lights up this time of year unless I add an AC unit in the grow room, and thats not happening. That means I will be free to try various other things between now and this fall as far as improving on the droplet size and air/water ratios. I am going to dig out my air compressor (it’s buried behind my rez at the moment and cant be reached), and experiment with some DIY atomizers. I want to see if I can get a handle on how much air I will need and how much water I can move with different arrangements or nozzle sizes, pressures, flow rates, etc. I have an old cheap airbrush somewhere too that I have to find. Some other potential issues will be the volume of air being blown into the root zone. I dont want to be blowing the plants up out of the net pots or popping the lid off the container they are growing in, so I need to think about that too. I think this will require a fairly large opening into the rez. 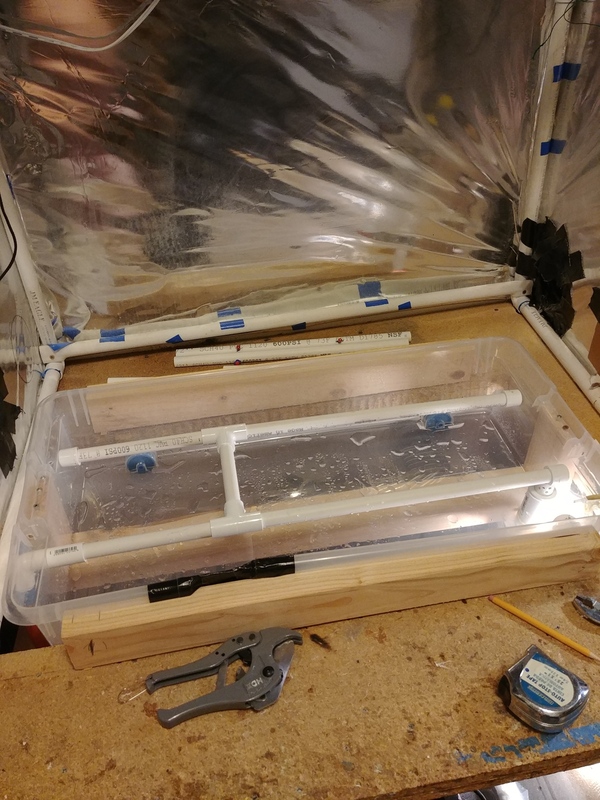 My drain is 1 ¼” PVC plus a ¾” over flow, so that may be enough to let the air out. Will need to test that though. Assuming I can get the noise issue resolved, I think I may need to leave the compressor on auto to keep the air tank full. I can control the air flow ON/OFF to the aerators with a programmable servo controller and a simple air valve or inflator that I already have. The servo controller will let me control up to 6 servos at the same time and I can program almost unlimited options as far as timing. The blower attachment I have should let enough air flow through to work several aerators at the same time. That last ones the kicker. Assuming I can get the atomization to work like I want it to, I guess I will need to start saving up for a super quiet compressor. Well, it turns out I am not the first one to think of using air to atomize nutes! Its proving difficult to find detailed info though - it doesnt seem to be too popular and those who use it dont seem to post much. There is more info on hybrid systems that use air along with hi-pressure water pumps - Air Assisted Aero or AA or AAA - and way more info on pure HP aero. I would really like to try HP aero, but Im really not in a position to do it with hi pressure water pumps and $$ mister heads and all the related parts and issues. Im still searching for build details and grow reports on systems that just use HP air to atomize the water/nute mix. From what I have gathered so far, I doubt I will be able to get good consistent, small droplet sizes though. The next question is - is it worth the trouble to just get a incrementally smaller droplets if I cant get most of them small enough? Im starting to doubt that. From what I have read so far, true "aero roots" - where they are only ever exposed to micro sized droplets of water, and NEVER submerged or completely covered by water - are quite different from roots that grow into a water solution or are completely submerged for any length of time. True aero roots are thinner, lighter and have lots of micro sized root hairs as opposed to thicker, heavier less harry/fuzzy water roots. 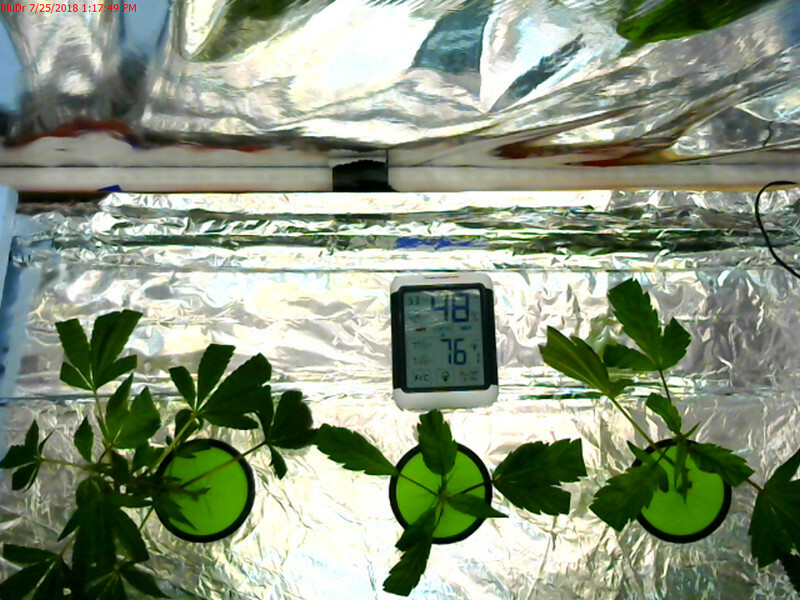 Ive changed the watering schedule from 1 minutes ON and 45 minutes OFF to 1 minute ON and 1 hr and 15 minutes OFF. The stems are drippy wet after 75 minutes of drying time, so Im increasing it to 1.5 hours and see how that does. My tiny root nubbins/bumps are getting larger, but very slowly. Obviously, Im not doing it as well as could be done as far as getting the clones to put out new roots. If anyone has any suggestions for changes to make on the next test, Im all ears. Here are the current details. Water is PH'ed to around 5.5, but drifts up to 6.3 over 24 hours. RH tends to stay around 45% these days in the tent. Lights on 24/7 at an average of about 50 watts. Watering cycle = 1 minute ON and 1.5 hrs OFF - but the stems always stay wet. Posting up in here so I can come read later I enjoy reading your very detailed posts, your process is awesome. Best of luck friend! Yesterday I looked closely at the clones and they were not looking good, so I went back and did more reading about cloning - without learning much new. I re-affirmed that the following aero-cloning methods are "best". 1) Run the water continuously 24/7 OR 15 mins ON and 45 minutes OFF OR 5 minutes ON and 30 minutes OFF OR 30/30 OR 1/45 OR 45/15 or..... in other words - any watering cycle you want to use is perfect The exception to that is no one recomends leaving the water OFF as long as I have been doing it = 1.5 hrs. 2) Lights should be very very low and only on 18/6 OR very low and 24/7 OR medium 18/6 OR medium and 24/7 OR.... pick any ligth schedule you want as long as its not full power. 4) Humidity should be kept hi with a dome - but only if you feel like it or maybe only on Thursdays.... be sure to vent the dome!! 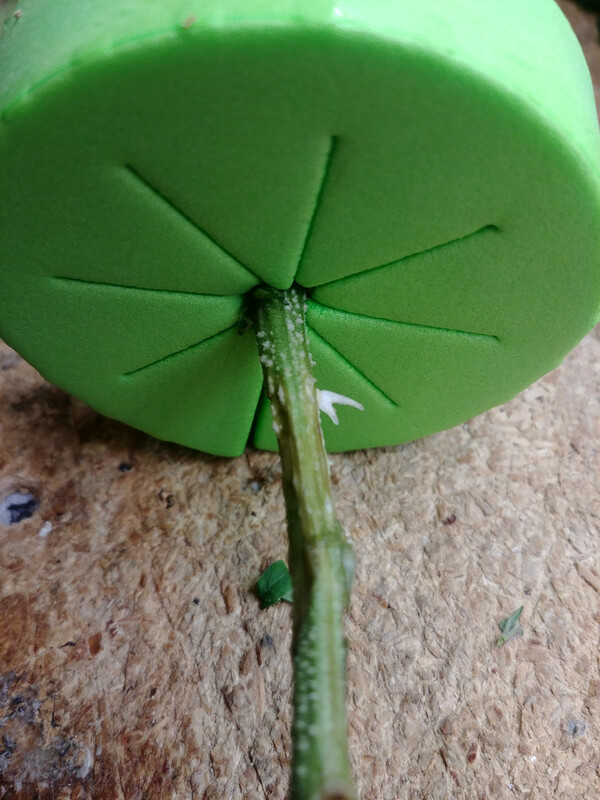 7) Cut the stems at an angle - almost everyone agrees with this one!! 11) Cut all the leaves in half - lots of agreement here. 13) Dont mess with aero-cloning its a waste of time. Just rip the darn things off with a brush hog and stick them in a glass of old spit water and stick them in a window. I was about to try method 13, when I found some actual root hairs starting to show up today!! One thread I read yesterday was mostly HP and LP aero growers and they seem to like faster cycle times - 1 minute ON at the most and 5 to 10 minutes OFF at the most, so I also changed my schedule to 1 ON and 5 OFF. I have no idea if thats what finally triggered the root to grow, but Im sticking with it for a while. @Larry3215 I've been watching your topics. If you would like to run a system I've been working on send me private message. Both systems are too $$ for me at the moment, but I just might be able to pull off an AA system by this winter. Im still trying to put together a parts list so that is still up in the air at the moment.